It doesn’t take much sifting through stats and pondering poverty and injustice around the world to make a person feel insignificant, powerless, and paralyzed. After all, what can I do? I’m just one person. On June 21 hundreds of people answered this question with the sound of spinning spokes. 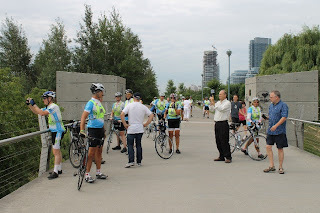 Expecting to bring in no less than $3 million, which will be distributed to local and global poverty-fighting and aid organizations, Sea to Sea 2013 provides an opportunity to sponsor cyclists as they make their way from Los Angeles to New York City on two wheels over nine weeks. Aside from the obvious goal of raising money, the cyclists involved in this year’s 3,900 mile Sea to Sea trek work their weary quads to direct our attention to poverty in our neighborhoods and across the globe and also to remind us that we can all do something to help change the world for the better. Every rider who has committed to at least six of the nine week trek across North America represents at least $10,000 raised, which will be distributed directly to people and organizations on the ground, working hands-on to promote justice for people who are economically oppressed. As heroic as this tour might seem, maybe we should check our enthusiasm before getting carried away by the tour’s ability to empower ordinary people to do extraordinary and heroic things. “You speak about doing extraordinary things in the world,” Sea to Sea advancement manager Terry Barnes cautioned me over email yesterday. “I’m more interested in helping move a person or community one step closer to self-sustainability.” It’s not about being a real-life hero; it’s about helping real-life people. Drawing from her experience teaching grade 6 in southern Uganda, 2013 cyclist Christeena Nienhuis reflects on her motivation for riding this year. “You see, for me, poverty has faces,” Nienhuis explains. “It’s not just some obscure notion about people suffering ‘over there.’” Sea to Sea is an opportunity for us to remember that fighting economic injustice is more than just throwing money at a problem; it’s helping PEOPLE. Poverty isn’t an abstract problem. It’s something real people face every day. Logistically speaking, this is no easy task. 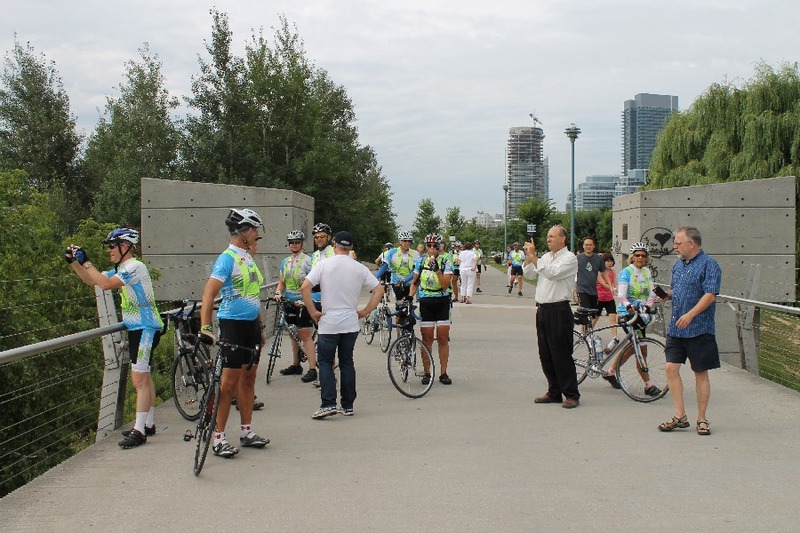 As a relatively small administrative operation, the Sea to Sea team puts careful thought into selecting recipients for the funds brought in by the tour. Every potential recipient goes through an application process and submits a proposal, and each proposal is individually reviewed and evaluated by the selection committee, which chooses the particular allocation of funds based on what they think will make the biggest impact. What’s unusual and refreshing about Sea to Sea’s approach is that their selection criteria, stated clearly on the application itself, favor proposals that fight poverty “by developing people or a communities’ capacity to provide for themselves.” The goal of the Sea to Sea fund is not to throw money at poverty and make the less privileged even more dependent on the money bags of the wealthy. Instead, Sea to Sea supports those people and organizations that recognize people as people, rich or poor, and those that fight poverty by developing one person or one community at a time to promote self-sustainability. The fine line to walk in fighting economic oppression and injustice is between cheap charity and robust justice. If we are more economically privileged, how do we pitch in and be charitable without setting up a power imbalance or taking away the dignity of the less privileged? How do we help without deepening the injustice of the system? Is charity work just a Band-Aid fix to a problem that needs open-heart surgery? We tipped our hats as the cyclists wended their way through Toronto yesterday entering week 8 of 9 on their journey to the Big Apple, our thoughts buzzing and hearts soaring as we watched the Sea to Sea 2013 tour tackle economic injustice by building up people and communities, one at a time. If you want to read further on how to engage with economic injustice and poverty, check out the book When Helping Hurts by Steve Corbett and Brian Fikkert as a resource that helps us find our bearings on these issues. For more information on Sea to Sea or to support the cyclists or follow their blogs, take a look at Sea to Sea’s website. Special thanks to Terry Barnes for his thought-provoking comments and for taking the time to share his thoughts with me. Matthew E. Johnson is a junior member at the Institute for Christian Studies, currently serving as the research assistant for the CPRSE. Thanks for your article,Matt. As our son,we have witnessed Terry's planning,along with the other staff members efforts,for the 18 months prior to the start of this event. Your documenting the 2013 Sea To Sea experience calls attention to a real world problem and one organizations attempt at serving a solution.